Fun. Hardworking. Here for you. 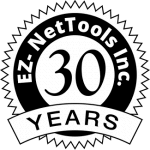 EZ-NetTools offers years of experience brought to the table by both employees and the decades of business we have. We want to deliver great service to you, our customers, and stay ahead of the curve. Our awesome staff is our key to achieving these goals and we are here to help you. Foster parent, hobby farmer, avid learner, popcorn lover, father and grandfather, project starter, wood worker. I am here to help you as a business owner. Youtuber, marathoner, french fry enthusiast, Ironman-in-training, mom of 4, cookie lover, go-getter, Netflix watcher, lover of naps, skill achiever. Full-time wife, mother, Nana, dance-studio owner, expressionist through lyrical dance (and all other styles), sister day creator, filled with pride and joy for my grandsons. Call and just visit, I love hearing from you! Artist, thinker, teacher, husband, dreamer, believer, lover of sunshine, and aspiring Renaissance Man. Family man, programmer, detail oriented, lover of both the outdoors and indoors, casual gamer. I specialize in website security and customized functionality for websites. Family lover, husband, hobby farmer, hat wearer, beard grower, systems fixer, truck owner, cheese maker. I’m the behind the scenes guy. If your website goes down, I will be there to get things back up and running. Writer, movie lover, pet lover, reader, gamer, NBA fan, simple liver, home is where the family is. Want your business website visible in the search engine? Singer, guitar player, cartoonist, dancer, writer, wannabe NBA player, sushi lover. I will ensure that your online presence is built on a strong foundation. I apply only the best SEO practices. Call me with any SEO questions! I have the answers to your Social Media questions as well! Musician, lover of the outdoors, swimmer, food lover, creative, lover of learning, tries to make things as efficient as possible. And usually does. I’m here to help you maximize participation on your social media account! Mother of 3 year old Penny, embroiderer, artist, lover of all food, and did I mention that I love coding? My favorite thing is to make a website run smoothly. In all my spare time, I write more code!